A relief from alphabetical monotony. This book is enchantingly fun. It’s interactive, stimulating and colourful; three aspects which are key to engaging the budding reader. If I’m being honest, I think I like this book even more than my little guy. Whilst he enjoys reading it, half of the novelty elements have been ripped off or nibbled on. The thing is, my little man is obsessed with his ABCs. As you can imagine, the result is that we have piles upon piles of ABC books. Since I seem to be in the mood for confessionals, I might as well tell you the sheer amount of letter and number books around the house is more for my benefit more than his. Seriously, you can only say A is for Apple so many times a day and in only so many ways! But ABC & DO has found a funky way to keep it fresh and interesting (thank you, Egmont… really!). One page is a puzzle (j is for jigsaw), another is a refrigerator and freezer, one with food and one without (E is for empty and F is for full), another has a telephone with a spinning dial on it (C is for call). The design of this book is a little bit brilliant. I bought this book from a Big W which means it is affordable and easily accessible. If your little one is caught up in the ABC craze, do yourself a favour and considering purchasing ABC & DO. 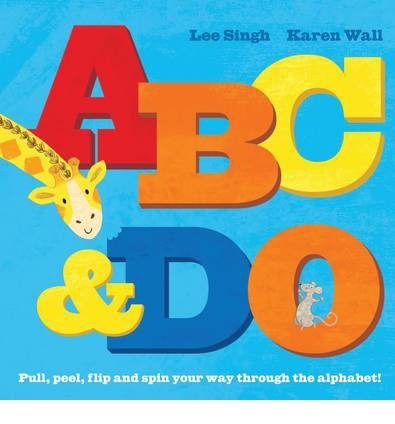 Written by Lee Singh, illustrated by Karen Wall. Recommended for children 3-5 years (or parents who are dreaming of apples, boats and cats).